Pentagon researchers say a new tool in the military’s arsenal will enable soldiers on the ground to order laser-guided missile strikes from high in the sky about seven-times faster than before. Officials with the United States Defense Advanced Research Projects Agency (DARPA) said on Monday that a recent exercise undertaken by the US Marine Corps successfully demonstrated the state-of-the-art abilities of a Persistent Close Air Support System, or PCAS, which lets troops coordinate attacks with precision from miles apart using specially-equipped Android tablets. In a statement, DARPA said the test occurred March 27 somewhere in the southwest US as part of Operation TALON REACH and involved the use of wearable tablets among infantry and aviation teams alike in order to carry out a simulated strike. Marines on the ground plotted out an aerial assault using portable tablets and a program called KILSWITCH — a contrived acronym of Kinetic Integrated Low-cost Software Integrated Tactical Combat Handheld — to successfully coordinate an airstrike in a fraction of the time it usually takes, DARPA said. Lt. Gen. Jon M. Davis, the Marine Corps’ deputy commandant for aviation, said he was “very pleased” with the success of the program after only a single exercise. Using KILSWITCH, Marines plotted coordinates on a map and then ordered an MV-22 Osprey aircraft hovering 4.5 miles away to launch a laser-guided Griffin missile that soon after struck the exact spot. According to DARPA, the successful exercise marked a first for the Pentagon with regards to integrating “automated, digital, real-time coordination capability into a military aircraft system” that supports ground forces. Lt. Gen. Davis, the aviation commander, said he wants every aircraft in the Marine Corp. to work with KILSWITCH, and DARPA said the air console is designed to mount on practically the force’s entire fleet. “‘Every aircraft a sensor, every aircraft a connector, every aircraft an [electronic warfare] node and every aircraft a shooter’ are our goals,” he said. The entire length of the exercise from start to finish was only a little over four minutes, according to DARPA—well shy of the six-minute goal and a fraction of the half-hour it could take now to accomplish as much with traditional means. Additionally, DARPA officials are touting the quick turn-around that allowed researchers to get the project off the ground in a manner of only a few months. “The PCAS test not only demonstrated new real-time communication capabilities, but also how quickly the system can adapt to different aircraft,” reads a DARPA press release. “Thanks to the excellent collaboration between DARPA, the Marine Corps and the performers supporting this activity, we were able to conduct a successful demonstration from a standing start in less than 120 days,” Brad Tousley, director of DARPA’s Tactical Technology Office, said in a statement. 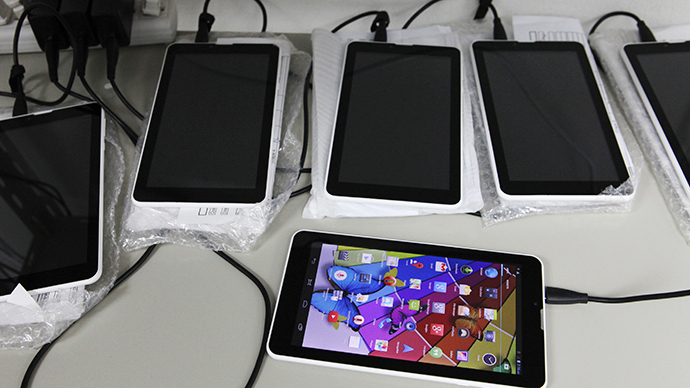 Thousands of KILSWITCH-enabled Android tablets have been used by the Marines since DARPA first began testing the devices in early 2013, but the latest exercise marks the first successful attempt at using the mobile interface to digitally plot and coordinate missile strikes, DARPA said.